Glenn Maxwell has been in the news recently after publicly criticising Bushrangers skipper Matthew Wade. In response, teammate Rob Quiney as well as former skipper Darren Berry have slammed the all-rounder with comments of their own. Maxwell originally spoke out when skipper Mathew Wade failed to put him higher up the batting order despite recent performances. Speaking to the press, Maxwell said that he was completely perplexed as to why he was batting behind Wade this season after averaging an impressive 56 run rate in the 2015/16 season. Maxwell stated that it is a bit painful batting lower down the order. He continued saying that batting below the wicketkeeper would exacerbate the feeling. His view is that the wicket keeper should bet batting at number 7 unless the captain is trying to squeeze one extra bowler into the starting line-up. When he was asked why he thought the captain put himself at number 5 and Maxwell at number 6, his reply was that as captain, you can choose the batting order. As a result of the interview, teammate Rob Quiney had a few words to say himself. Quiney said that Maxwell’s attitude towards the placement was probably not the best. Quiney went on to say that Maxwell needs to put some runs on the board. Victoria is doing exceedingly well but Maxwell is failing to stand out above the rest. According to Quiney, Maxwell batted 6, 6, 5, 3 and 4 which and doesn’t really know what Maxwell is on about. To add to this, former skipper Darren Berry said that Maxwell’s attitude was selfish and not within the overall wellbeing of the team. Speaking to the press, Quiney said that it is good that Maxwell is honest about his feelings but it is probably not the best attitude to have at the moment. When quizzed, Peter Handcomb has more information on the team saying that the overall goal was to go out and win games for Victoria. He said that captaincy is putting out the order they think will achieve the goal. Meanwhile Darren Berry was critical of Maxwell’s performance lately. 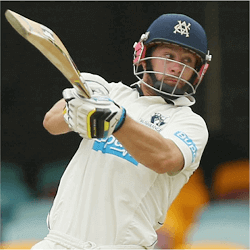 The all-rounder scored a high of 81 runs followed by 10, then 3, 6 and 29 in the Sheffield Shield season. He feels Maxwell has missed the mark having a selfish attitude in a team sport.